Chocolate became a part of French court life before Louis XIV was even born; his mother - Anne of Austria - hailed from Spain whose colonies in South America had already introduced Europe to chocolate. Like her mother-in-law, Queen Marie Thérèse was also passionately fond of chocolate. She drank it as often as possible; Elizabeth-Charlotte of the Palatinate wondered whether the queen's bad teeth were due to her excessive use of chocolate. Madame herself never indulged in the same taste since she claimed that her system did not digest "these exotic drugs" (including coffee) very well. The very exotic nature of chocolate also led to it getting a somewhat mixed reputation. On one side it was said to be beneficial to one's health but others claimed it to be a major health risk. While Madame de Sévigné acknowledged that chocolate was in fashion in the 1670's she certainly had her reservations. In a rather memorable moment she relayed the story of the Marquise de Coëtlogon who gave birth to a black baby - the cause was based on chocolate. Despite the more obvious reasons for why the infant may not resemble to husband it was noted that the poor child died shortly afterwards - perhaps it was ill or had not gotten enough oxygen. One of the other risks associated with chocolate related to the theory of the bodily humours. This well-known theory (that I will not go into further depth in here) led the doctors to fear that excessive intake of chocolate could change a person's natural "humour". To those born with a "hot humour" this could be dangerous but some born with a "cold humour" could use it to their benefit. Madame de Pompadour's libido was notoriously low and she used chocolate in an attempt to seem more passionate - not necessarily in a sexual manner. This led her companion - Madame du Hausset - to remonstrate with her mistress that it might be dangerous to her health. Louis XV certainly did not need encouraging when it came to drinking chocolate. He loved the drink and would often enjoy making it for himself in his private apartments. The chocolate of Louis XIV's reign was much richer and heavier than the store-bought products we are used to today. Louis XIV quickly noticed that it had the ability to "trick" the appetite and the Sun King was not the only one who took note of this. Philippe II d'Orléans would - according to his mother - often drink a cup of chocolate rather than having a meal since he believed that one vast meal a day was sufficient. The Spanish tradition had it that chocolate could be mixed with chili and as the 18th century went on other spices were added too. Vanilla, cinnamon and even cloves were favourites; others added orange blossom, sugar or sweet almonds. - the Duc de Penthièvre and his family. Despite that chocolate was not a completely new concept at Versailles it was nevertheless popular - and exotic. As such it was dutifully served at the appartements thrice a week along with pineapples, peaches and other exotic wares. Therefore, it is hardly surprising that chocolate was a privilege reserved for the upperclass. This did not change throughout the remnants of the French ancien regime - in comparison it was available to those of fewer means in London. 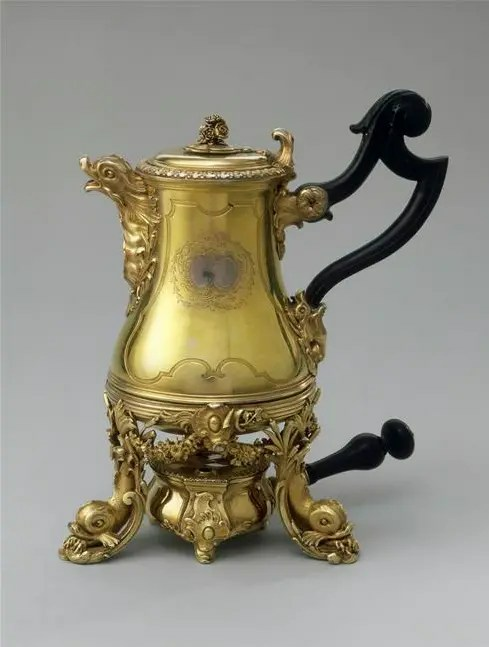 As an exotic ware it did not take long before the rich beverage was linked to life's more sensual pleasures. Plenty of rumours and gossip has arisen when it comes to the use of chocolate in this manner. Both Madame de Pompadour and Madame du Barry were said to use chocolate in their intimate life with Louis XV; the former because she was said to have been a "cold fish" and the other because she allegedly had an "insatiable lust". Neither are exactly to the women's credit and whether they are true can only be guessed at. It is, however, typical of the slander at the time to target women's sexuality and especially the king's mistresses (for obvious reasons). When Marie Antoinette set sails towards France she brought her own chocolate-maker with her; he was duly given the official title of "Chocolate-maker to the Queen" with an annual wage. The Austrian-born queen had grown up in a court where chocolate was often consumed for breakfast. This trend had spread across the courts of Europe and she could continue the habit there. As chocolate was embraced in the higher echelons of society it gave rise to a new line of luxury items. One of the best preserved from the age of Versailles was Louis XV's gift to Marie Leszczynska following the birth of their son. She received a full service which accommodated all the "exotic drugs": coffee, tea - and chocolate. In the previous century, Louis XIV, Marie Thérèse and the Grand Dauphin had each received "chocolatières" from the king of Siam. According to the Mercure Galante Philip d'Orléans had entered two chocolatières in the prizes for a lottery he held in July 1689. One was of porcelain and the other of silver - the pair was won by a Madame de Maré. Initially, the sale of chocolate was monopolized. Louis XIV gave David Chaliou the right to sell chocolate in France. During the 18th century the increase of production in colonies - as a result of the slave trade - meant that cocoa beans were more available. However, this did not mean that the French commoners suddenly had free access to the delicious drink. It remained a reserve for the wealthy. According to Massimo Montanari it was not until the 1770's that chocolate became a part of a downright industry. Wendy Sutherland reports that the first chocolate house in France was opened in 1675. Presumably, this café was linked to Chaliou since his monopoly only ran out in 1693. After that the chocolate market opened up for other entrepreneurs.